As U.S. college graduates earn their bachelor’s degrees and enter the job market this month, data from the Census Bureau show that the share of college-educated young adults in today’s workforce is higher than ever before. Four-in-ten Millennial workers ages 25 to 29 had at least a bachelor’s degree in 2016, according to a Pew Research Center analysis of Current Population Survey data. That compares with 32% of Generation X workers and smaller shares of the Baby Boom and Silent generations when they were in the same age range. In 2016, almost half (46%) of employed Millennial women ages 25 to 29 had a bachelor’s degree or more, up substantially from 36% of Gen X women workers when they were the same age in 2000. Millennial men in the workforce are also more likely to hold a bachelor’s degree than their Gen X counterparts were as young adults. Among employed men ages 25 to 29, the share of college graduates rose from 29% in 2000 to 36% in 2016 – a considerable increase, but still smaller than that seen among young women. Consequently, the gender gap in college attainment among young workers grew to 10 percentage points in 2016. This gender gap is driven in part by the fact that young women are more likely to finish college than their male counterparts. In 2016, among 25- to 29-year-olds, women were 7 percentage points more likely than comparable men to have at least a bachelor’s degree. While education levels have increased among young workers across all major racial and ethnic groups, the large gaps that existed among Gen X workers in 2000 persist among Millennial workers today. 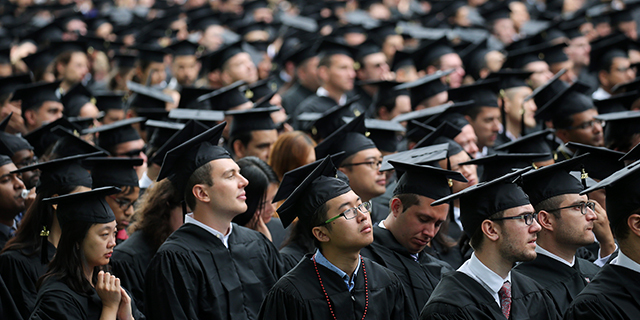 Asian workers in the U.S. are the most likely to have completed at least a bachelor’s degree. In 2016, about two-thirds (65%) of Asian workers ages 25 to 29 had at least a bachelor’s degree, compared with 47% of white workers in this age group. And although the share of young black and Hispanic workers who are college educated has grown, just 27% of black Millennial workers and 21% of Hispanic Millennial workers held a bachelor’s degree in 2016. The Northeast region of the U.S. leads in the share of young workers who are college graduates. Half of Millennial workers ages 25 to 29 in Northeastern states had at least a bachelor’s degree in 2016, 12 percentage points higher than the share of Gen X workers in that region who had finished college in 2000 (38%). The share of young workers with a college degree in the Midwest, South and West also increased from 2000 to 2016, but to a lesser extent than in the Northeast. Young workers living in metropolitan areas are far more likely to have earned a bachelor’s degree than those in more rural communities. In 2016, 42% of young Millennial workers in metro areas held a bachelor’s degree, an increase from 34% of young Gen X workers in 2000. By contrast, just 24% of young workers in non-metro areas in 2016 had completed college, up from 20% in 2000. The increase in educational attainment among Millennials comes as the economic payoffs of a bachelor’s degree – particularly in terms of earnings – are greater now than they were in the past.